I committed the cardinal sin when it comes to Atonement; I saw the movie before reading the book. But, in my defense, it was an Oscar-nominated movie, and I did go back and read the book after the fact. This is actually my second time reading the novel; it was that good the first time around. It’s one of those rare stories that was captured brilliantly by the film, most likely because it’s not too laden with action, relies heavily on the words, and so filmmakers don’t have to stuff it all into 90 minutes in the editing room. 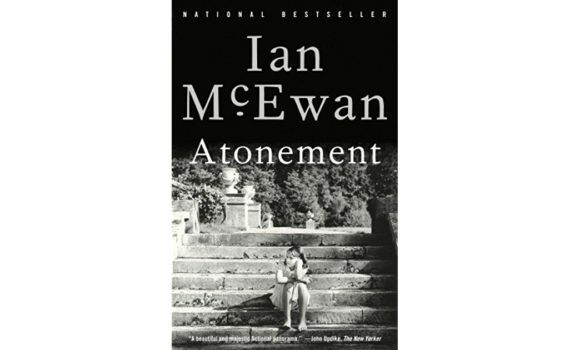 It somehow works as wordy introspection in book-form and as quick simplicity in movie-form; maybe that just shows how great McEwan did with the writing, it doesn’t matter how you absorb this plot, it’s simply excellent it whatever form. The story is presented in three acts, with a postscript to tie up the details. All are excellent, but it’s the first part that sets the stage and the tone, that really feeds us the meat. The Tallis family live on a beautiful estate in England without a care in the world. Or at least, they did, before Hitler and his talk of war, but even that is somewhere in the near future, not in the present, which is a hot summer in the country. Father is at work in the city, Mother is resting with one of her migraines, Leon, the eldest brother, is on his way home, Cecilia, the sister, is back from school, and Briony, the baby, is writing a play for the occasion. Three cousins are come to stay pending their parents’ divorce, so the house is quite crowded and chaotic. Briony happens upon three moments between Cecelia and Robbie, a young man whose mother is a servant, that will change the course of all their lives: an exchange by the fountain, a passed note, and a meeting in the library. Briony’s childish assumptions surrounding these events will lead her to accuse Robbie of a crime later in the evening, sending all of their futures into a downward spiral that there is absolutely no stopping. So part one is the introduction, but it’s about half the book, and contains most of the action. Part two is focused on Robbie, part three is Briony grown a bit, and the postscript settles all accounts. It’s a phenomenally written book, if a bit long-winded and British, if that makes sense, a sweeping melodrama about love and guilt and regret that isn’t exactly easy to read. But it is beautiful to experience, there is so much more worth that work written here, so much to enjoy despite the melancholy. Briony is a great character, Robbie allows us to see Dunkirk from an interesting angle, the end will make you weep bitterly when the author reveals the final truths of what happened that night in the country, and what has been ruined by it since. Read with confidence, especially if you like this period, because you will feel transported there, even though the novel was written in modern times. And check out the film as well, which is a strong representation of a stellar book.